SPW048761 SCOTLAND (1935). R and J Garroway Netherfield Chemical Works, Duke Street, Glasgow. An oblique aerial photograph taken facing east. Title [SPW048761] R and J Garroway Netherfield Chemical Works, Duke Street, Glasgow. An oblique aerial photograph taken facing east. Shop on corner of Todd St.
Duke St. at Todd St.
Parkhead Forge, Train crossing Duke St. Covered walkway leading up to dog track. 1912 Cast Iron Police box - Location C31 - Fleming Street Removed in 2005 by the Glasgow Police Museum, it was restored to its original Red livery. It was on display for several years, but once the museum moved to a new building it was put into storage. Looks like the works shunting steam locomotive. Netherfield Chemical Works, No 694 Duke Street, Glasgow This shows the office of the works from the south-east, photographed from a train on the Coatbridge line. The building on the right is part of the fertiliser works. To the left of the office is the steep roadway leading under the railway to the sulphuric acid works. 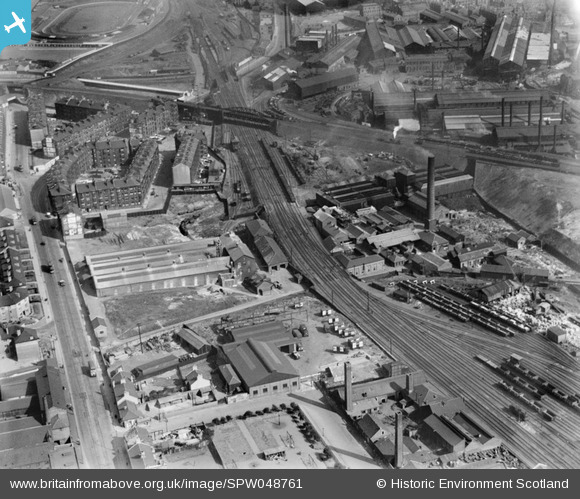 Glasgow was a major centre for chemical manufacture in the 19th and early 29th centuries. Garroways was one of the last surviving firms in 1970. Since then fertiliser manufacture has been abandoned, but the works was still producing sulphuric acid in 2002. This works was established in 1851 by John Garroway, and made sulphuric acid and superphosphate fertiliser. In 1871 the site was split in two by the construction of the North British Railway's Glasgow to Coatbridge railway. The fertiliser works occupied the northern part of the site. Source: RCAHMS contribution to SCRAN. This building was used as a changeover for bus drivers operating along Duke street in the 1970s. Entrance to Carntyne Greyhound Racecourse, this last relic was demolished in 2012. Trying to find out when the tunnel was demolished here, I was going to both Shawfield and Carntyne dogs from 1970 onwards and the tunnel wasn't there then.